This entry was posted in completed projects, corsets, Historical Sew Fortnightly. I like your fabric! Why do corsets grow? I swear they always grow. Must be they stretch when you lace them up the first time. I’m thinking that is what happened. It is all cotton so that has to be it. I just can’t believe it stretched so much! I didn’t cut on the bias. Oh well, I expected a learning curve. I am happy that it is at least usable! As for the sizing, tell me about it… I’ve been in an epic war with an 1880 corset pattern… the first one I made was extremely comfortable, but was way too big! And the second one, which I just finished, it too small in the bust area! I’m glad my first one was and under bust because I have epic battles fitting things on the girls as it is…never mind trying to corset them. And I’m fairly sure they aren’t the same size. Hows that for to much information. Lol! That gave me a good laugh! I just finished adding two triangles to my corset in the bust area, and now it doesn’t look quite as nice, but it is SO comfy now. 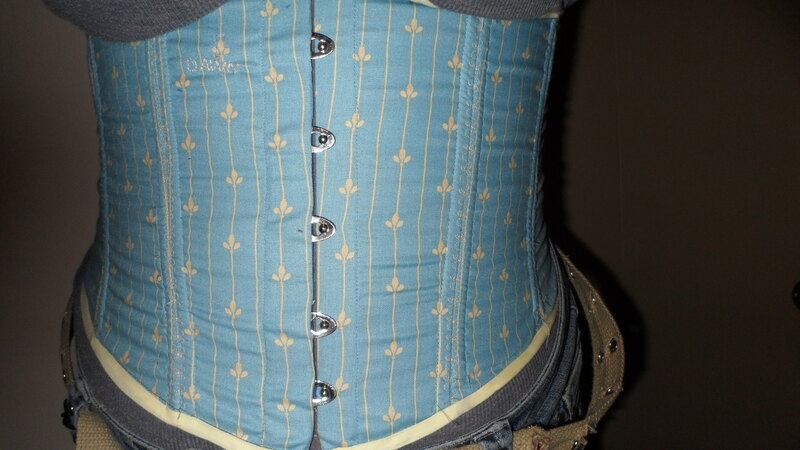 Corsets and bodices are just a pain to fit for us ladies. Men have it easy. EASY, I say!